One of my first posts I did way back when I first started Blogging. I fell in love with it then and had to keep it. I STILL have it and LOVE IT! I haven't tired of it yet! When we got home my husband found a scrap piece of wood and attached it and then used my wood burning tool to etch in some lines. (I would have done it, I just think he was hoping if he did this right away I would finish it right away) YEAH RIGHT!!! SOOOO it sat like this in the shed for almost 4 months waiting for inspiration!! Well it never came until I pulled out a bunch of other furniture and decided to just paint a bunch at the same time. Just like when I do a painting, sometimes the inspiration comes while you are working on it and SHAZAM!! that's what happened with this one. I decided I would only paint the legs and side of the table. I would let some of the spray get on the top but not too much. When it was dry I sanded off a bunch of spots on the top and in the middle. It was at this point I decided that I wanted it to look like an old crate of some kind....BUT WHAT??? I had planned on going to the graphics fairy for an old label or something, but then I remembered taking a picture of an old wine crate a while back. Then I got to painting in. When it was dry I sanded it down again to look worn. Then I went over with some wood stain. I only did it in certain spots though. I didn't want it to look uniform. I wanted it to look worn and old. I am IN LOVE with how it turned out. It had started out as a project to sell in my booth at CHANGING THYMES and ended up as part of my family. My husband (who I adore at his love for all my stuff..even if it isn't the greatest) came home from work and said.."YOU CAN'T SELL THIS" "IT'S TOO COOL"
Wow! That turned out fantastic. The paint finish alone is lovely, but the lettering just makes it that bit more special. I love this. I have never done any stenciling. Looks like something you need a steady hand at. Das Ergebnis ist einfach WUNDERSCHÖN !!!! Looks like we had similar thoughts on tables this week!! Fouond you at Redoux! Cheers! Found your link at Mustard Seed and I am so into this style of table lately!I adore how this turned out! My hubby said the same thing when I redid a small end table. It going to be sold, but he wants to keep it now. I love this table! Great idea!! It's so unique, and you brought out it's gorgeous potential! If the person who threw it away ever comes across your blog, they're going to be kicking themselves! I'd love to share it with my readers! Oh my GOODNESS, this is just FABULOUS!! Love how you used your wood burning tool to add the lines...GORGEOUS!!! Wow, this turned out really nice and it looks like it has a natural wear to it. Perfect! I started to leave a comment a few minutes ago and clicked away before I saw the word verification box. Sorry about that! I'm just dropping by from Amanda's party and wanted to tell you that your table looks beautiful! What a wonderful way to treat that table--it looks really, really good. I agree with your husband! What a terrific job you did! I like the use of the woodburning tool! I would be delighted for you to link to Potpourri Friday (in progress) and Giveaway! This table is so unique and you so creative! I adore the graphic! I love your table! It is lovely! Great job! Wow, your table looks fantastic! You did a great makeover on it! That looks great! I really love the way it turned out! You have been on a tear....W.T.G. I just love the lettering, it gives it such character.....loved all the pieces you have shred with Potpourri friday. That came out so cool! Nice job on turning trash to a real treasure! What an amazing transformation!! You did a fabulous job as always! Thanks so much for linking up again to The Creative Spark. Have a wonderful week! 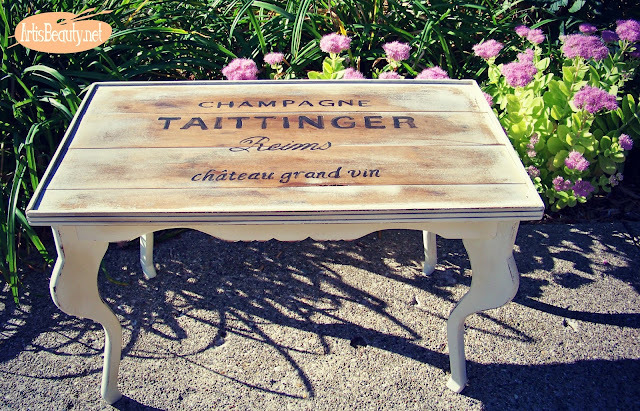 Love me some bubbly, this table is just amazing!!! What a fabulous idea! so cool! i especially love the shape of this table. it's so unique and pretty! beautiful transformation on your table! What an change...who would have known that a plain table could turn into something so unique and beautiful! Thanks for linking up to the Creative Genius Link Party! I'd love to see you link up again tomorrow! 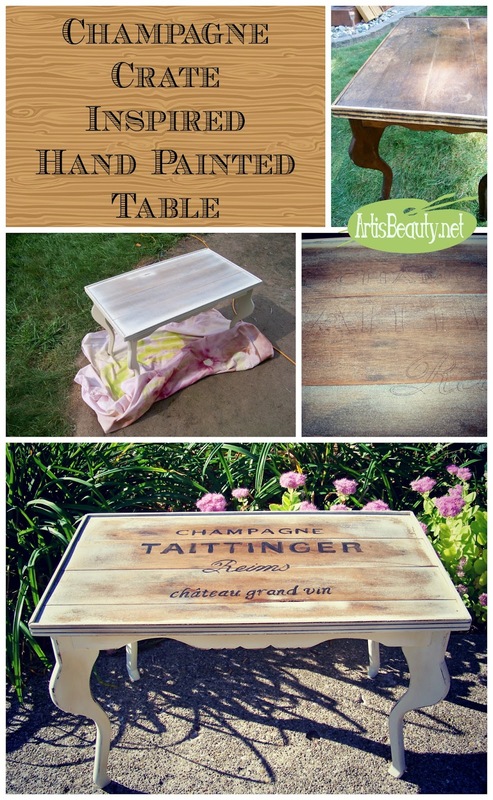 I absolutely love this table Karin! I can't wait to try something similiar on my coffee table. Thanks for the inspiration. This is such a cool table! I just started following your blog. I found you through Miss Mustard Seed's link party. What a great transformation! It looks lovely. The table really turned out well. I'm looking to do something similar in my living room. Now all I have to do is find the table! Found you via Miss Mustard Seeds' Favorite Furniture 2011 party. oh I absolutely LOVE this!!! you did a really great job with painting & distressing! I would be thrilled for you to share this at my linky party, Inspire Me Fridays! I know my readers would enjoy seeing it! This is absolutely gorgeous i saw it on Hometalk and just had to stop by and check out you blog..:) awesome! !